1. Preheat oven to 450°. In small bowl, stir sour cream and hot sauce until well combined. Cover and refrigerate until ready to serve. 2. On large rimmed baking pan, arrange Tater Tots in single layer. Bake 24 to 26 minutes or until golden brown and crisp. 3. Meanwhile, cook bacon in skillet according to package directions until crisp. Transfer to paper towel-lined plate to cool; chop. 4. Remove Tater Tots from oven; immediately transfer to serving dish. 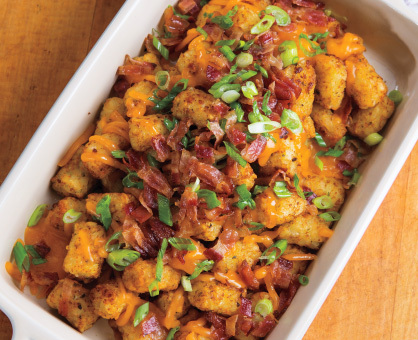 Evenly sprinkle tots with cheese, bacon and onions; serve with sour cream mixture.